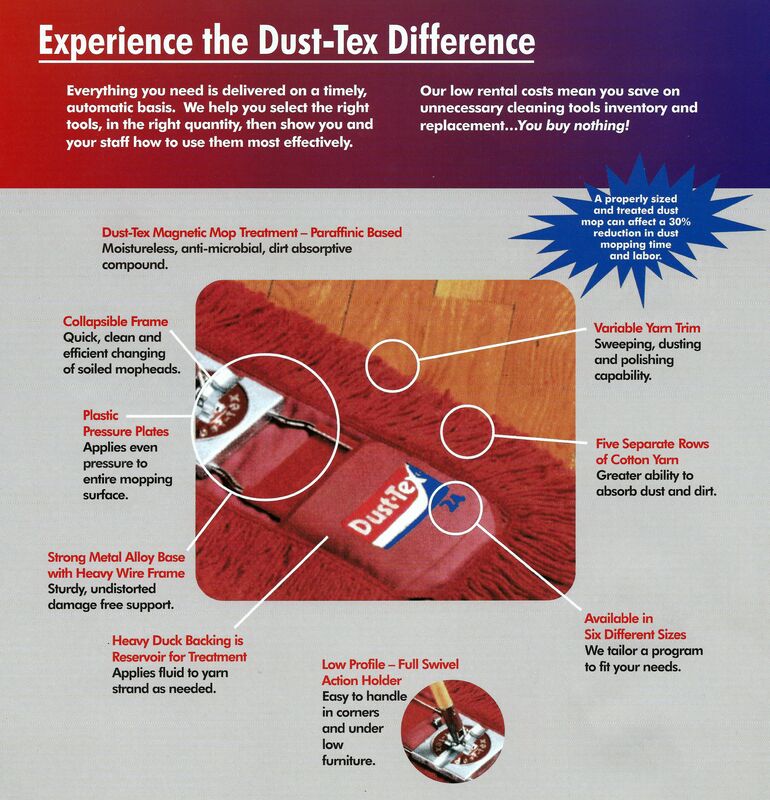 The right sized dust mop, regularly cleaned and treated with our unique treating formula, can eliminate up to 30% of the time spent mopping. Our mops are treated with a highly effective formula which provides the aggressive dust-holding properties essential for maximum soil pick up and retention. Our treated mops typically pick up and hold 50% more dirt than untreated mops, saving you time, money, and labor. Your floors stay brighter with less frequent scrubbing, waxing, and refinishing. 12" - 24" - 30" - 42" - 60"
Our rugged mop handles and frames are easy to maneuver and provide for simple loading and unloading of mops. And best of all, we don't charge rent for them like the other guys. You can use our handles and frames at no additional cost as long as you are renting the mop heads from us. Special yarn construction makes our wet mops far stronger and up to three times more absorbent than ordinary mops. Looped ends keep yarns from unraveling and linting off. The tailband holds mop yarns securely in place - yarns can't tangle or come apart during use. Because the tailband holds yarns in perfect side-by-side alignment, these mops cover twice the floor area per pass with no gaps in coverage. Out wet mops are delivered to your door on a regular basis - fresh, clean, and ready to use. Check out ouir retro commercial!